Her pale skin has a very slight blue hue that sets of and enhances her expressive eyes. Eyes that reflect the hardships undergone, whilst showing a playful and flighty nature. As the shadows play across her elegant features her eyes take on a sapphire cast. Her seraphic face is framed by a swathe of thick silvery hair that curls down her back to rest on the small of her back. Her svelte body gracefully flows across the floor, hinting at the danger in her attractive frame. She wears sleeveless scale mail, that channels the air elements blowing her long hair around her. Down each arm a snake tattoo wraps around, the head in the palm of her hand. Long thigh-high black boots, which just expose a winged serpent tattoo upon her legs. 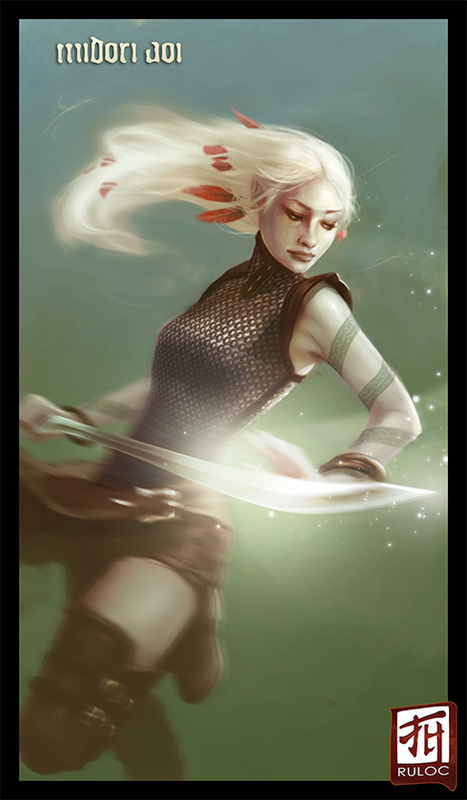 On her hip is a long elven curved-blade (katana), jade hilted with no guard.